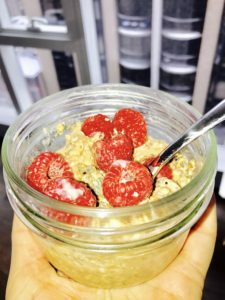 Overnight oats may seem like a trendy breakfast, but as we put our “Best Fork Forward” this National Nutrition Month, I want to convince you that this trend is one worth making a staple in your home. I’ll give you the general how to info. I’ll back it up with 3 recipes. Ummm. No brainer here. Overnight oats can be sweet, savory, spicy and healing. They’re loaded with fiber, antioxidants, immune boosters, inflammation suppressors, gentle on the stomach and oh, so very satisfying. They’re portable. You can make a batch for the work or school week. You don’t have to measure perfectly. These little pots of yumminess are great for any meal or snack. Your 4 year old can make them. Grab a bunch of 8 -16 oz mason or jelly jars that make an airtight seal. You only need the 8 oz and they’re perfect for an individual serving that you can toss in your bag, but if you like to add a pile of berries, spinach or a hard boiled egg, go for the bigger size. Here’s the formula: ½ cup oats of your choice + ½ cup milk of your choice + toppings. Here’s the process: put the oats, milk, and dry toppings in a jar and stir or shake to combine. Mix in additional toppings (nuts, seeds, fresh fruit) as desired, or add them right before eating. Refrigerate 4 hours or overnight. Can be stored up to 5 days. Be creative! A sprinkle of coconut, dark chocolate chips or cinnamon are amazing additions.